Former Israeli ambassador to Washington Danny Ayalon believes midterm elections set Trump up nicely for 2020 elections. 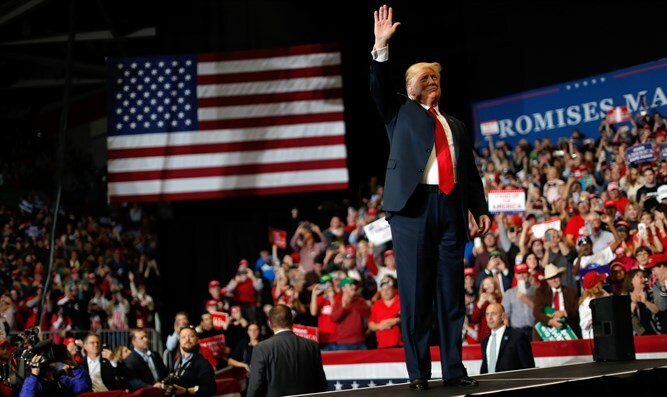 Danny Ayalon, former Deputy Foreign Minister and Israeli ambassador to Washington, opined on Thursday that the results of the midterm elections in the US actually indicate that President Donald Trump is in a very good position ahead of the presidential elections in 2020. "All in all, this can be considered a success for Trump. Losing the House of Representative is a regular ritual of every incumbent president. Obama lost a lot more seats in the House of Representatives as a sitting president. The party that loses the presidency is usually hungrier and more frightened, and it is easy to energize its voters. This is what happened here," Ayalon told Arutz Sheva. Ayalon said he believes that the loss in the House of Representatives will serve Trump in the presidential elections in 2020. “This is what we call upside-down logic. When one of the two Congresses is against the president, it does make it difficult to legislate and pass a budget, but then the incumbent president can accuse Congress of failing to deliver on election promises. Congress is already less popular than the White House and if the Democrats intend to make life difficult for Trump in the House of Representatives - they will simply give him someone to blame." As for Israel, Ayalon said he believes that Israel will continue to benefit as long as Trump serves in the White House. "A Democratic Congress does not affect foreign relations, only internal legislation. This is in any case the most sympathetic administration Israel has ever had and it will continue to be like that," he concluded.